Sometimes, I pick a palette because I like the brand. However, there are times when I purchase a palette because I’ve played with the colors in the store. Moreover, I’ll choose a palette after reading about it. After having a makeover, if I like the look, I’ll buy the palette. Most of all, I will buy a palette because I am in love with the colors. Or, I like the look of the color placement in the palette. For example, the New Tom Ford Quads have such beautiful color placement, they look like pieces of art. 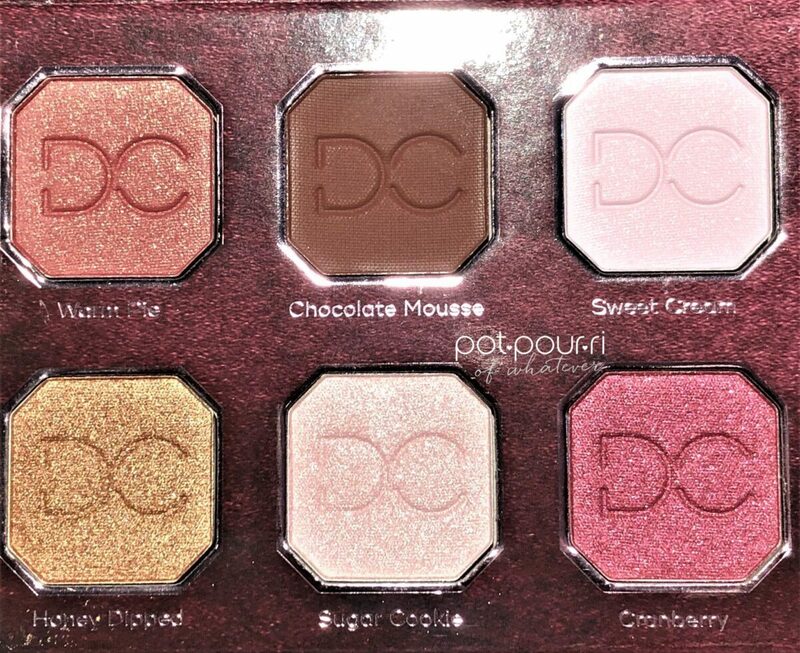 In fact, when I saw the Dominique Berries + Cream Eye Shadow Palette on line, I purchased it. Although, I didn’t know one thing about it. In fact, I had never even heard of the brand. 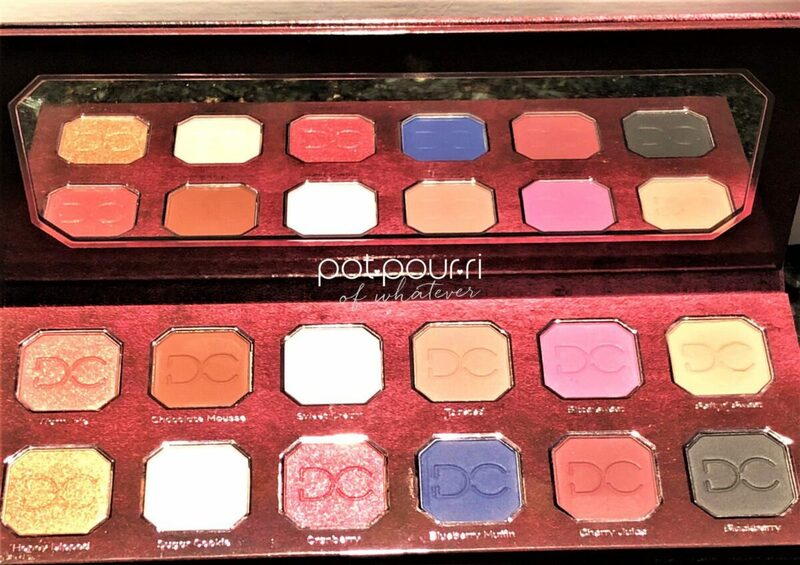 I purchased the Dominique Berries + Cream Eye Shadow Palette for several reasons. First of all, the color story was beautiful. And, I loved that the placement of the colors made the palette cohesive. Furthermore, I like that the palette was oversized. Above all, I loved the colors themselves. 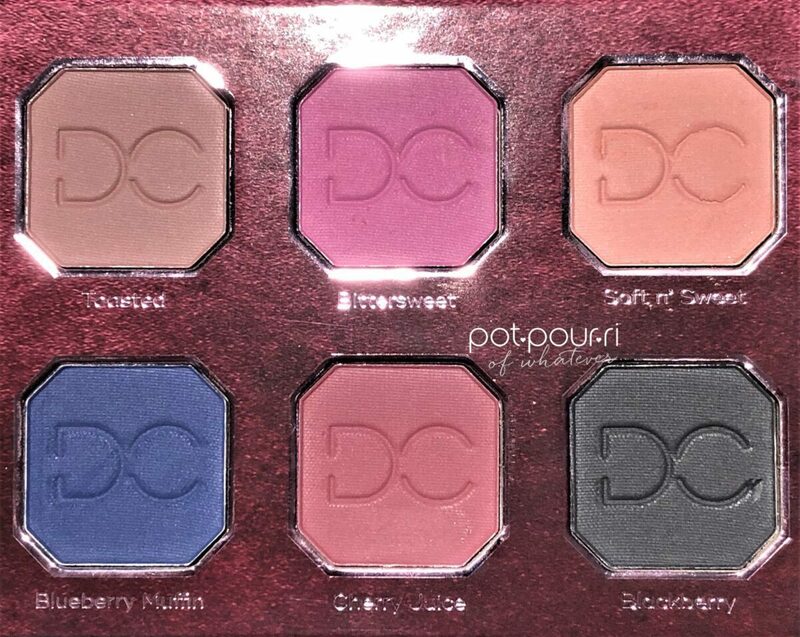 The palette has twelve matte and shimmer shades. I had never heard of the brand’s founder, Christen Dominique. At any rate, I learned that Christen is a successful You tube vlogger. Evidently, Berries and Cream is her third makeup launch. As they say, the third time is a charm. And, they are right! 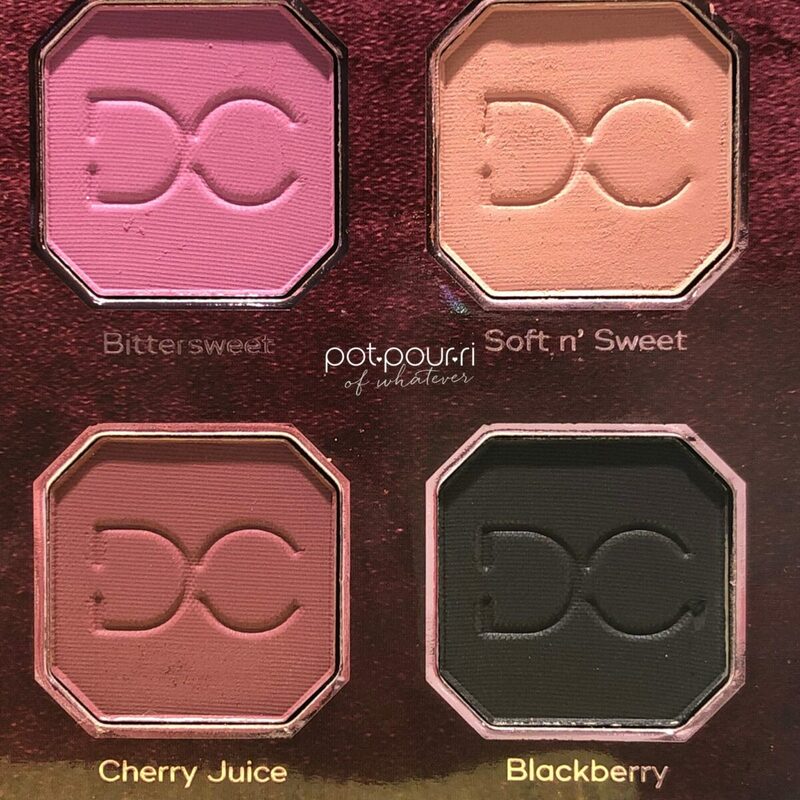 Dominique Cosmetics made it to Sephora, where I found Berries + Cream! 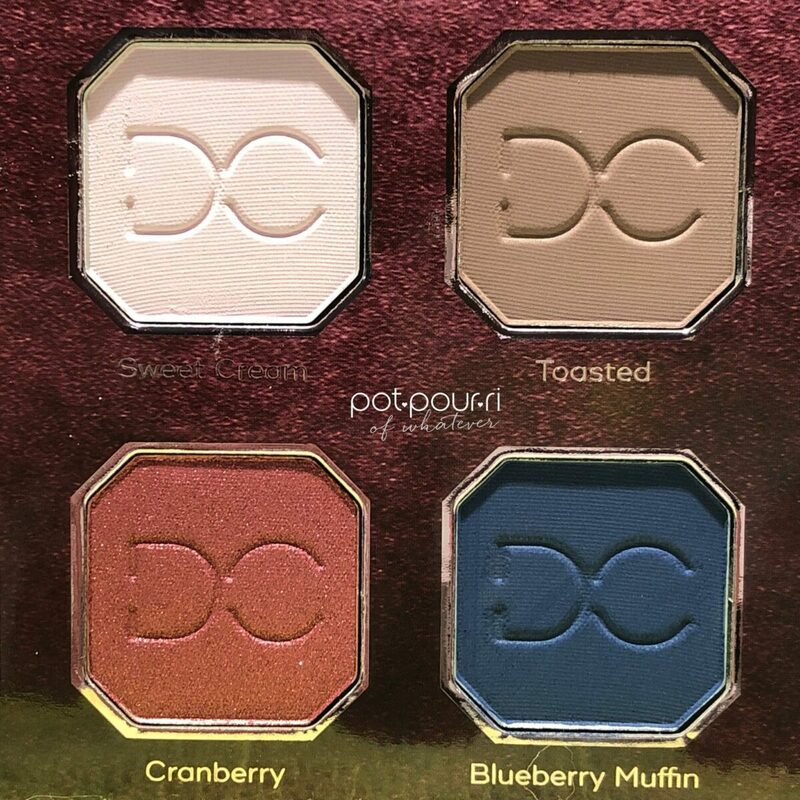 Dominique Cosmetics Berries + Cream Eye Shadow Palette is at Sephora. 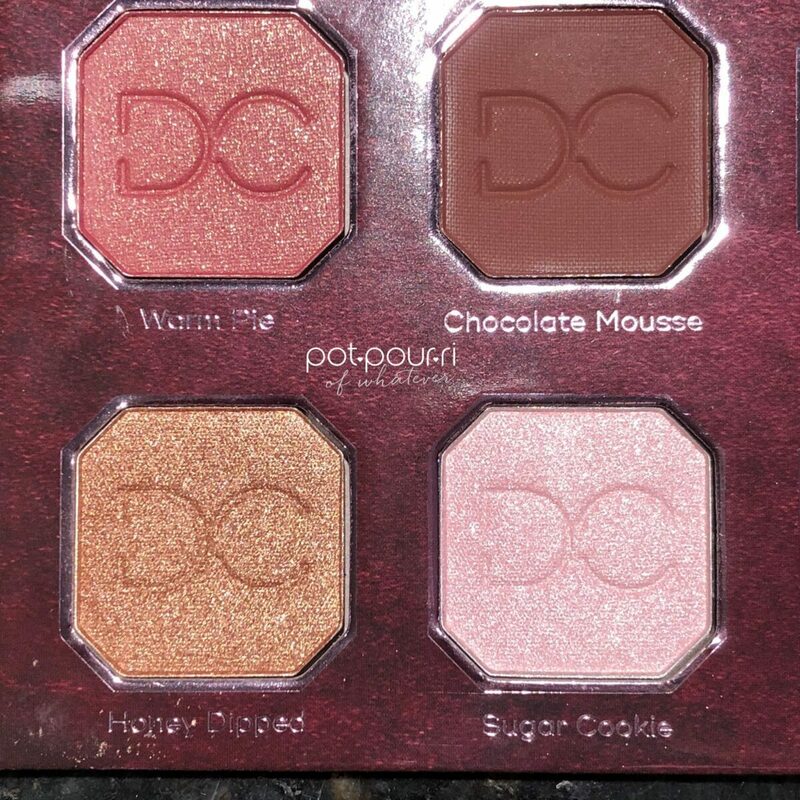 Also, you can find Berries + Cream on the Dominique Cosmetics Website. Berries + Cream retails for $44. The packaging details begin with the palette’s outer sleeve. First, the sleeve is in a chrome pink shade, that reminds me of pink champagne. Furthermore, the DO logo is on the front of the sleeve. Slide the sleeve off, and you’ll find the Berries + Cream compact. To begin with, the compact is out of sturdy cardboard. The outer cover looks like crushed velvet. However, the cover really has the crushed velvet effect painted on the cardboard. 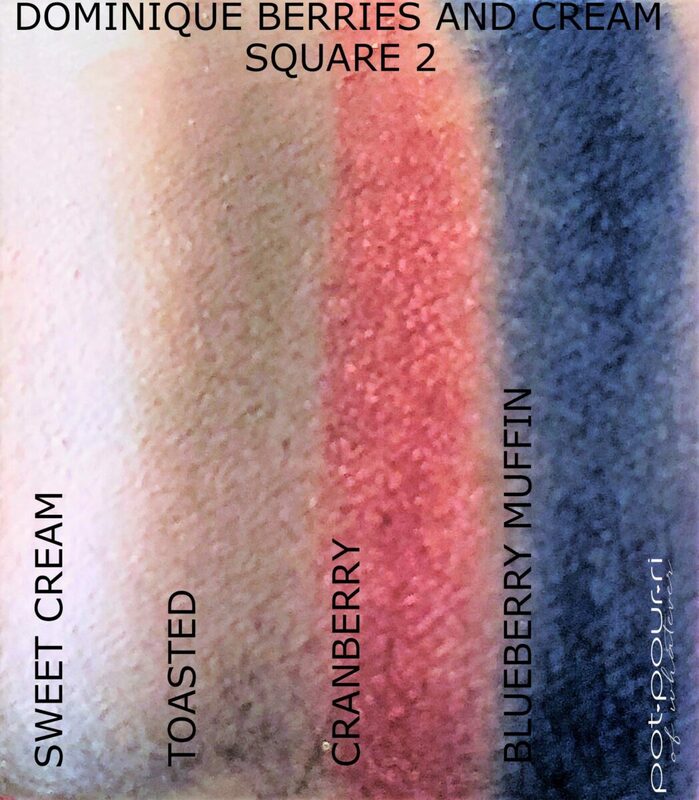 Next, the cover is an ombre that begins with the deepest berry shade, and ends with the lightest cream shade. One side of the compact has a full-sized mirror. The other side of the compact has the twelve eye shadow shades in octagon shaped pans. Last, the eye shadows are over-sized. 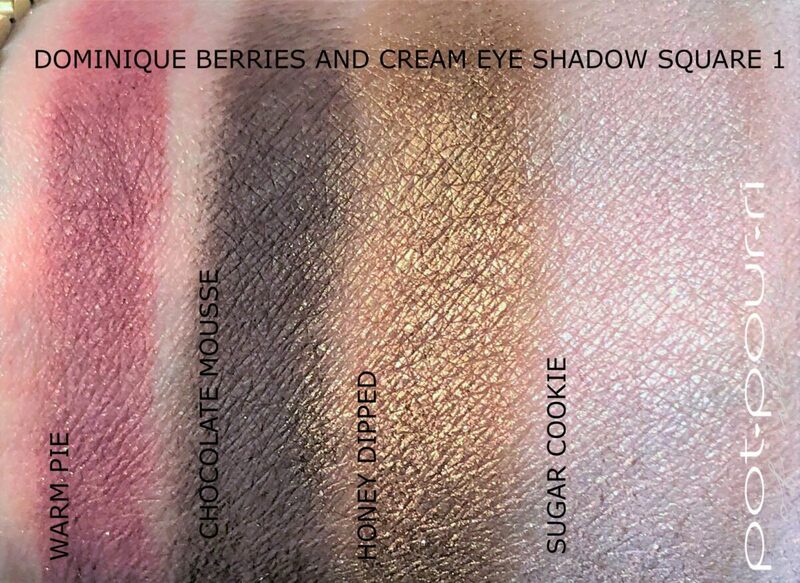 In fact, Berries + Cream is an oversized palette! For one thing, the formula has rich, pigmented matte finishes. Furthermore, there are three shades that are intense, and they have sparkling shimmer finishes. Most of the shades were buttery and creamy. However, some of the matte shades. when applied, appeared patchy. Although, there was not a lot of fallout. Instead, the mattes seemed powdery and chalky. One of the formula’s ingredients is talc, which is powdery and chalky. Most of the shades blended well. Also, the shades were long-lasting, even though I wasn’t wearing a primer, or shadow base. First of all, I organized the colors in three squares of four shades. Therefore, each square has two from the top row, and two from the bottom row. As a result there are three squares. All I can say is, who knows why I did that! The only reason I could think of to get all the colors into the photos, in order to have cohesive photos, if that makes sense? First, I’m starting on the top row, left hand side. First, Warm Pie is a warm brown shade with a matte finish. Also, the finish has some glitter in it. Warm Pie can be used as a crease shade. Also, I like it on the outer corners of your eyes. It looks great smoked out, to create a smoky eye. I would even use it to line my lower lashes. If you want some drama, you could also use it on your eyelids. Next, Chocolate Mousse is a rich chocolate brown shade with a matte finish. First, I love this rich brown shade as a liner for your lower lash line. However, use it in your crease for more definition. Also, use it on the outer corners of your eyes for more drama, and a smoky look. The next two shades are from the bottom row of the palette, starting on the left. Honey Dipped is a bronze-gold shade that has a metallic finish. This shade looks amazing all over your eyelids. Also, use it in the inner corners of your eyes. Also, it can be used on the outer corners of your eyes. Use it over your lower lash line shade. Next to Honey Dipped, Sugar Cookie is a bright pale pink shade with a shimmery finish. It looks great mixed with darker colors to lighten them up. Also, use Sugar Cookie on your brow bones, or on the inner corners of your eyes. It also can be used as a base color. Starting at the top of the palette, next to Chocolate Mousse, is Sweet Cream. Sweet Cream is a pale pink shade with a matte finish. It can be used to brighten the area under your eyes. Also, use Sweet Cream on the inner corners of your eyes. Moreover, you can use it to highlight your brow bones. Also, you can use the pale pink shade as a base for your eye shadows. Next to Sweet Cream, Toasted, is a cool toned taupe-grey shade with a matte finish. Toasted can be used as a transition shade, in the crease. Also, use Toasted on your eye lids. In addition, use the taupe grey shade in your crease for a soft every day, natural look. You can also smoke out your outer corners using Toasted. On the bottom row, next to Honey Dipped, Cranberry is a cranberry shade with a shimmery finish. I love reds on the eyelids, in the crease of the eyes, and as eye liners. Also, use it on the outer corners of your eyes. It creates a sultry look. Blueberry Muffin is an intense cobalt blue shade with a matte finish. You may be asking what this intense blue is doing in this palette. According to Christen, the colors in the palette have undertones of blue. I love the shade because cobalt blue is my favorite color. Hey, I even wear cobalt blue as an eye lid color. However, you can use it in a more subtle way by lining your lower lash lines with it. Or, use it on the outer corners of you eyes. The last two on the top row are Bittersweet and Soft N’ Sweet. First, Bittersweet is a magenta shade with a matte finish. Layer Bittersweet to brighten a deeper transition shade. Also, use the magenta shade on the outer corners of your eyes, in your crease or all over your lids. Next, Soft N’ Sweet is a taupe shade with a matte finish. this is one of your work horse shades. The reason is, it goes with all of the other shades in the palette. Therefore, use it as a base shade on your eyelids. Additionally, Soft N’ Sweet makes a great transition shade. 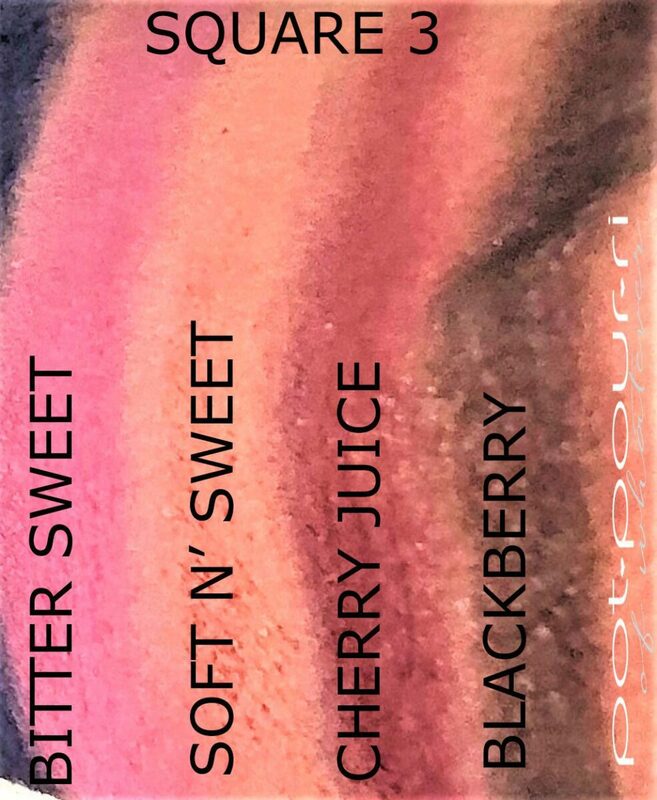 The last two shades on the bottom row, Cherry Juice, and Blackberry finish square 3. Cherry Juice is a rich plum shade with a matte finish. This is a great shade to add definition to your eyes. Therefore, you can use it as a crease-transition color, on the outer corners of your eyes. and as a liner. Also, if you really want to make a statement, wear it on your eyelids. Finally, Blackberry is a black shade with a matte finish. Don’t be scared of black shades. Normally, you would use a black shade to add drama to your look. I often put black in the outer corners of my eyes. I love the drama that black adds when you use it as a liner, or when you use it in your crease. However, you can also create a gorgeous, sultry smoky eye using the black matte color. On the whole, I am not sorry I purchased this palette. I love the palette’s color story. Also, it has my favorite shade, Cobalt Blue, in the palette. The formula is o.k. It isn’t Tom Ford, Natasha Denona or Pat McGrath, but it also doesn’t cost a small fortune either. For a $44 palette, the formula is fine. 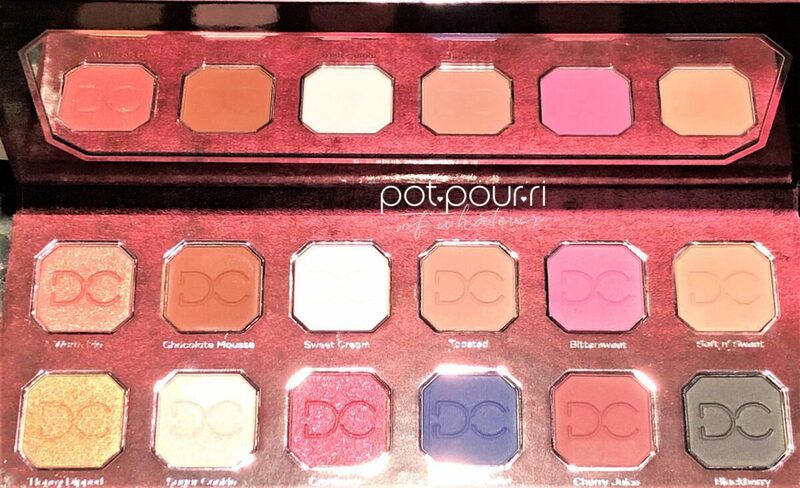 It is a great palette because you can create a sultry, glam and glitz look ,or a sweet and innocent look. On the whole, the color story is beautiful. Also important, the palette is a well thought out, cohesive palette. What do you think about this palette? Let me know in the comments below. I must apologize if you haven’t been receiving my blogs. It is my fault, Yes, I have been writing them. However, I use Mail Chimp. In November, I had a problem with Identity Theft, and had to change all of my charge cards. I forgot that Mail Chimp needed an update. My Bff, Randi, kept telling me she wasn’t receiving the blog. My mother also said she wasn’t. Unfortunately, I though sometimes the blog goes into spam. Then, more and more people were telling me they hadn’t received the blog for a long time. Hopefully, the problem is solved. 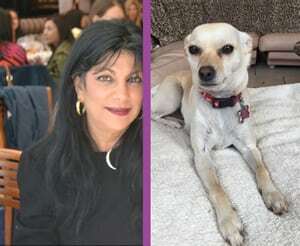 I can assure, you, I’ve written tons of blogs since November, so if you are interested, go to my home page and see what you’ve missed!